Hey you! Microsoft has stolen 25 <billion> Hungarian Forint.Â To the Hungarian people, give that money back. Right now! 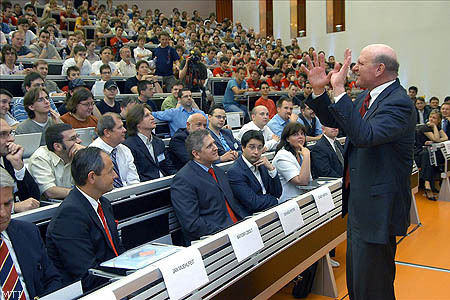 Following the “friendly disruption” Ballmer calmly continued his talk, wherein he wasÂ found by index.hu to be a surprisingly brilliant speaker. Â In the Q&A he admitted to being egged before, in 1966 (no doubt on Halloween, when he would have been 10). While the whole incident took place in broken English, Fake Steve Jobs is looking for a Czech translator! ?Â I am sure you’ve seen the originalÂ recording of theÂ event posted on youtube – here is the Bono version.Â Now we know who the Eggman is, but who is the Walrus? You are currently browsing the johnkemeny.com weblog archives for May, 2008.